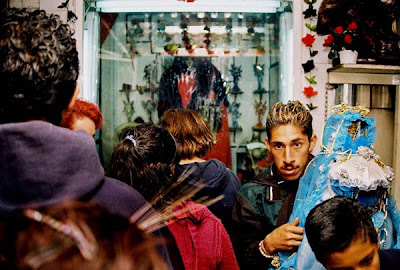 The cult of Santa Muerte began as a sect of the Roman Catholic Church within Mexico. 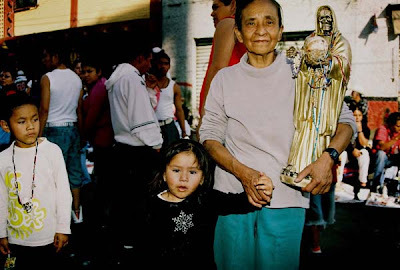 Her altars and shrines join the millions through out Mexico already dedicated to the Virgin of Guadalupe and St. Jude. As her popularity spread beyond Mexico’s borders to US cities and as far south as Argentina, it was time to intervene. Pope John Paul II deemed her believers as devil worshipers and refused to recognise her as a saint, but this has had no effect in deterring her followers. 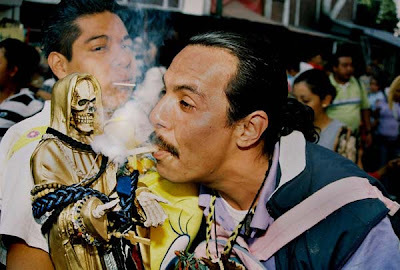 The origins of Santa Muerte are not completely clear but the most widely accepted story seems to date back to pre-Hispanic times. It is believed she derived from the Aztec goddess of death Mictecacíhuatl, mistress to Mictlantecuhtli, Lord of the land of the dead. This goddess seems to have morphed since the Spanish inquisition into a grim reaper like figure worshiped by millions, living on the fringes of society. 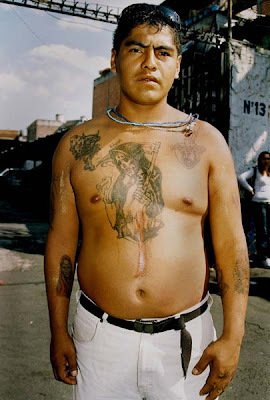 Followers include members of the notorious gang, Mara Salvatrucha (MS-13), members of the Mexican Drug Cartels to lowly vendors and street kids of Mexico City. Jeffrey received a Bachelor of Arts (Hons) Photography, 2007 Dun Laoghaire Institute of Art Design & Technology, Co. Dublin, Ireland. 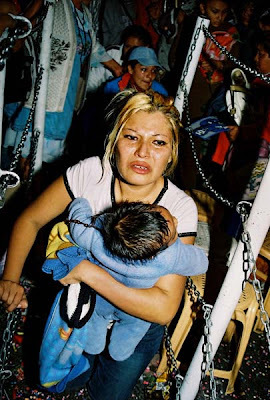 He is currently working as a freelance photographer who's main interest is to document social and political issues around the world, particularly within Latin America. Great essay! Especially the first photo tells an entire story. Wondering what's written on his back. here's a ruff translation of what written on the back of the man in the first photograph. 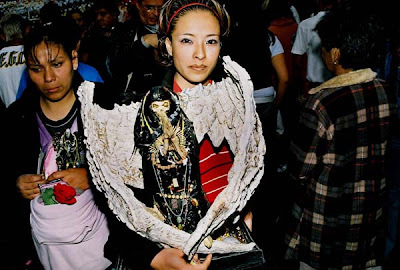 My child (referring to La Santa Muerte) place down your cloak,bring peace and harmony. Oh white sister everything you do day by day whatever or where ever you are you protect me and free me from everything bad with your divine power and of Gods. Thanks Jeff, it makes a lot of sense in this context. But overall (for a non-believer like me) the whole cult-thing still doesn't. Though I am thinking now there's a catchy wisdom in all this cult: thinking of life in terms of death. It probably just makes everything easier for people in underprivileged communities. ya it can me a bit heavy at times. it obvious affiliation to people especially involved in crime of some sort, can be due to there closeness and aware of death at all times. 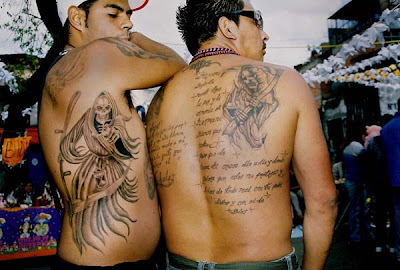 gang members pray not to be killed and also ask for forgiveness when they do, La Santa Muerte is also very popular among homosexuals and prostitutes as they feel the catholic church has abandoned them and they say La Santa Muerte or Death does not discriminate we all must meet her regardless or class or creed. 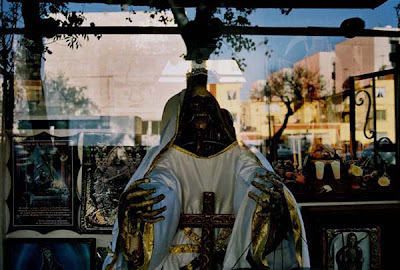 Great Photoessay and indeed an intense whoreship of the lady death. An interesting mix of "crime" and "catholic ethics".... hope to see more Jeff! @Anonymous: Of course they do. What browser do you use? The problem might be in your computer. I disagree with the term "cult" here. As for "worshiping death," Christians have been doing exactly the same thing. Furthermore, Santisma Muerte has many wonderful abilities. Catholics the world over believe in going to different saints and angels to ask for favors, and many of the people featured here ARE Catholic, so why is this any different? It is true that many "bad apples" have taken to using Santisma Muerte's name, but this is a fairly new practice, and I think it has much more to do with the image of her as a skeleton, rather than her actual qualities. 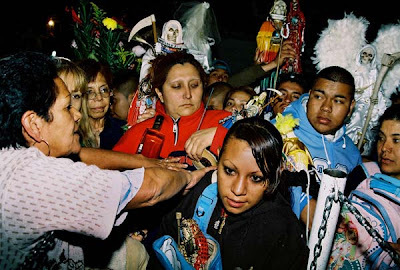 In addition, Santisma Muerte is now considered a "banned" saint, as so many others are. The church feels it can just "do away" with whatever it likes at any time, without a thought to the feelings of it's followers, and THIS is the result. Her best known quality is punishing unfaithful husbands and lovers, NOT hiding drug dealers. One of my favorite myths about her states that she killed herself when she found her lover unfaithful, and thus will punish unfaithful men when called upon. There is a lot of amazing historical stuff about her Goddess aspect, too, if you'll take a moment to do your homework before you just jump to conclusion. I dont believe in any of this but we all believe in something! But I have to say I love the first photo,, those tattoes are amazing!! love what the sencond tattoe says! I believe on her!! !she has a wonder power!!!! Santa Muerte de mi madre que me ayude con mi hermano que está golpeando las pandillas y le dispararon seis veces en el estómago. La Santa Muerte doesn't have anything to do with the devil..either way me you and everyone else is going to pass sooner or later and it could be GOD sending death for you to go.just because you believe in Lady Death doesn't mean youre a devil worshipper.Lady Death is just doing a job the our Lord is sending her to do. He sends her to get us..And she's a saint..just because you believe in her doesn't mean you don't believe in God. people should be more scared of the living not the dead..
Nice photo essay of all of the esse's. Bizarre. The Roman church has long been oblivious to syncretism, and as a consequence she's birthed some of the craziest cults around. the only person we should worship is jesus for he is the only true way to heaven. Lucifer is the great deceiver and by praying to any saint you are only praying to him and his demons. So you are saying that anyone who is Catholic and believes in the Saints are worshipping Demons? So you think that MOTHER THERESA was a Demon Worshipper? So St. Peter, Mathew, Mark, Luke and John as well as Our Lady of Guadalupe, Our Lady of Grace are Demons? I am sure that SAINT Peter will welcome your statement when you die. Funny, it never occurs to me to spew hatred to other Christians or other belief systems but I am sure that you believe that the Jewish people are damned as well. It's a shame when cousins marry. all i gotta say , wat i want to say ill say it to mi padres dios y mi santa muerte ,,respect to all others cuz god is the only one when he needs us and wit my ninia blanca known as LA SANTA MUERTE , are the only one for me too this point and thanks to them my mother his still here wit me , and other family member as well ,, thats how high my faith is for mi padre dios and my santa muerte is.. some people just dont know how to respect others beliefs and wat ever makes u happy.....i can sit here and type over and over nothing is gonna make me change my mind,, santa muerte de mi corazon no me desapares con tu protection si ahi policia que no me miren si ahi balazoz que no me alcansen si peligro socorrame por un buen camino........ ee dicho. 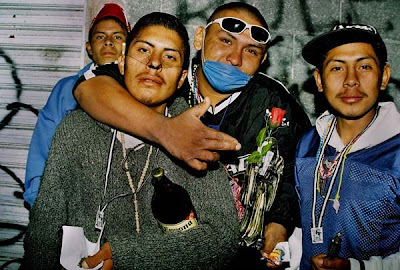 Some friends of mine were forced until the cult of the Santa muerte. They were forced ti make blood sacrifices to the alter. They were possessed by demons. 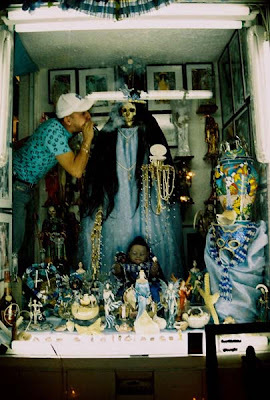 Believe me or not, but there is NOTHING Christian about worshiping the Santa d la muerte. All of you that continue this worship will find out soon enough. My God be with you and forgive you for this blasphemy you ar partaking of. The Bible clearly shows any type of idol worship besides the All Mighty God is wrong. One cannot pretend to be a Christian or Catholic and ignore what the Bible says about all these things. May God forgive this sinful and perverse generation we live in. 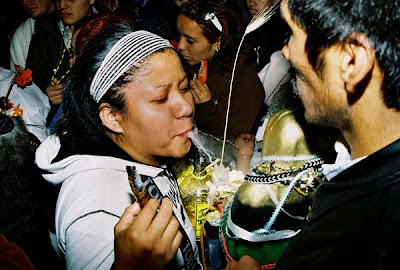 Quizás el culto a esta mujer calavera traiga felicidad a algunas personas, inclusive Milagros. Pero a las finales, cualquier reverencia que se haga aparte de Dios, el único y Santísimo Dios de la Creación, es mala. Venerar a ídolos es como venerar a Satanás. El diablo está claramente detrás de esta falsa religión. Algunas fotos que tienen en el Internet se muestran con el 666 y uno con el pentagrama de Satanás. Dios mando a su Hijo Jesucristo por amor a nosotros, para poder ser salvos, su gracia debería ser suficiente. Las cosas temporales de este mundo y sus placeres, pero la palabra de Dios nunca pasara. Amén. Fortunately we have a loving and forgiving God. This is a result of not educating yourself with the word of God. It is because we go around believing things taught by human ideas, beliefs scenarios and opinions that we get caught in a web of confusing information and traditions that never were part of God. If you really believe in God pick up the bible and study the scriptures, God will open your heart to understand the word. If you dont believe in God thats your human freedom that you were given but just because you dont believe in God doesnt mean you are right. God himself says in his word that we are allowed to do anything whether its good or bad but at the end wat we have done will be brought out into the light for all to see. interpret that as you want but the truth is in the bible not our collections of feelings, thoughts, traditions and mixed up information. There is no way to God except Jesus Christ, he sacrificed his life so that we can have a relationship with God. No one else is to be prayed to for anything. We all need Gods grace to do the right thing. Study your bible then you will know the truth and the truth will set you free. Satan comes to kill and destroy us physically and spiritually. Even Satan is allowed to perform miracles, but remember this he will still have to answer to God at the end. It is because of God that we all have freedom to do goid or bad, but it comes with a price at the end. I was once ignorant until I educated myself through Gods word. I have a catholic upbringing but guess what all those things I was taught werent even part of Jesus's teachings. 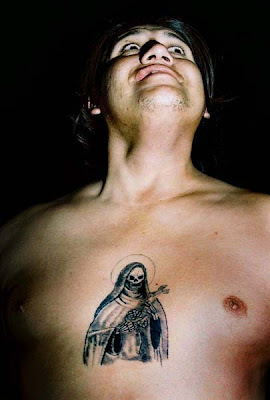 The father of my baby, who is in prison now, is a follower of Santa Muerte and let me tell you she is not good. He may love her because she got him him out of jams in his wrong doings but she stands for everything God doesnt. Money, Greed and nothing holy. He believed he did white magic. Thing is he would ask for money, she brings money she helps u get away with wrong doings, gets u out of harm but will harm you if u dont do her upkeep. u need to have a shrine for her, need to feed her food cigarettes alcohol flowers. dont box her up n forget her or she will haunt you. you hear her nails tapping all over the walls like they are craeling fast n lite. He would say it was rain, it was her! yes she is of the devil, she tried to kill him. we saw her in the time after he had boxed her. she was angry but she couldnt harm me, only him because I did not like her. I knew she was dark and she is of the dark. she doesnt bring peace or light or joy or blessing n if so its only limited so that u are decieved to continue with her n not God. She tried to take his spirit, to kill him. I hap to slap him to snap him out of it. he said a woman was motioning to him with her finger to come n she had his spirit in a trance. this was after she told him to drink paint thinner n kill himself infront of me. he will never admit it is her but I Know It was her. I took a necklace off his shrine wjen I boxed her away n a couple hours later their was a bang under her box on trailer floor n her nails tapping n the trailer door even opened n it had a hook in a hole type of lock. I had to.put her box farther away outside for her to stop. She is a demon n can only hurt her worshipper in the end. YOU CAN NOT SERVE TWO MASTERS.. FORGIVENESS FOR THOSE WHO DO NOT HAVE ENOUGH FAITH IN THEIR HEART. TURN TO THE HOLY MOTHER FOR HELP EVEN WHEN ALL IS LOST. GOD GAVE US THE GIFT OF FREE WILL. UNFORTUNATELY SOME OF US CHOOSE UNWISELY. CONCECRATE YOURSELF TO THE HOLY MOTHER. SHE WILL ANSWER YOU. GO IN PEACE AND LOVE. All this passionate discussion about who to worship and who to avoid is sad. But also interesting, from an anthropological aspect. 34 comments so far. What do you think?